Mesmerizing aromatics with flavors of black tea and exotic spices, smoothed by a splash of milk and sugar. 96 Count $63.80 $61.80 On Special! 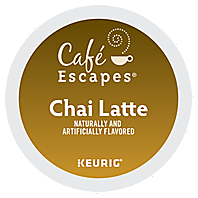 -Store Chai Latté K-Cup packs at room temperature. -Shake the K-Cup pack before brewing. -Use the 8-oz. setting on your brewer. -Run a hot water brew cycle (without a K-Cup pack) after brewing Chai Latté. Our Chai Latté brews hot! Always test before serving to young children.